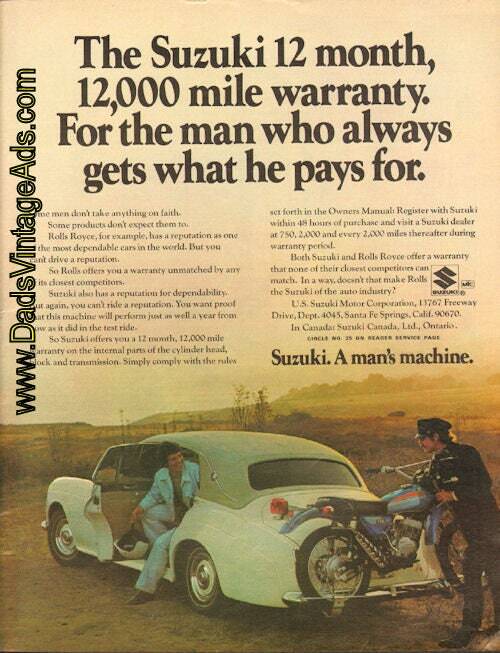 The Suzuki 12 month, 12,000 mile warranty. For the man who always gets what he pays for. Some men don't take anything on faith. Some products don't expect them to. Rolls Royce, for example, has a reputation as one of the most dependable cars in the world. But you can't drive a reputation. So Rolls offers you a warranty unmatched by any of its closest competitors......Suzuki offer you a 12 month, 12,000 mile warranty on the internal parts of the cylinder head, block and transmission...Both Suzuki and Rolls Royce offer a warranty that none of their closest competitors can match. In a way, doesn't that make Rols the Suzuki of the auto industry?